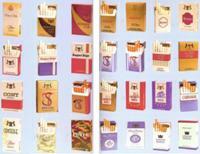 President Hugo Chavez's government says it is considering a decree to ban the production of cigarettes and tobacco. Health Minister Erick Rodriguez, in an interview late Monday with Union Radio, said the government wants to minimize the amount of smoking in the country and "promote a healthier lifestyle." Rodriguez said the government plans to impose a limited smoking ban at bars, restaurants and other establishments where food is sold. The regulation would also prohibit "economic activity" related to tobacco production, he said. "What good does the consumption of tobacco do any of us?" Rodriguez asked. "Any one who wants a cigarette should bring it from abroad." An industry survey has indicated that about half of Venezuela's 26 million people are smokers. At present, imported cigarettes cost roughly the same as local brands about US$1 (EUR0.74) a pack. Venezuelan cigarette producers include Cigarerra Bigott, owned by British American Tobacco, and Tabacalera Nacional, a subsidiary of U.S. company Philip Morris. Both companies said they had no immediate comment on the government's plan.